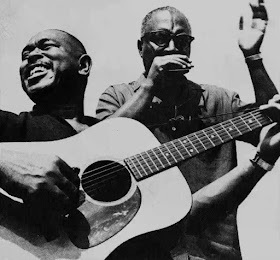 The magnificent blues duo of singer/harmonica master Sonny Terry and singer/guitarist Brownie McGhee were the first really old musicians I ever got to know. Sonny and Brownie started working as duo in the early-1940s and had been playing together for nearly three decades by the time I met them sometime in 1969 or ’70. Sonny and Brownie were playing a five-night gig at the Back Door – a great, but short-lived folk club in Montreal – and I think I went at least three or four of those nights. I remember their sets as being fantastic. I particularly loved songs like “Rock Island Line” that they would sing together. And I remember being fascinated watching the muscles in Brownie’s arms move as he played guitar. On one of those nights, I screwed up my courage and asked if I could talk to them about Woody Guthrie. I had become fascinated with Woody and had been listening to his records and reading everything I could about him. I had seen their names associated with Woody and I recognized that the amazing and distinctive harmonica player I was listening to at the Back Door was the same harmonica player I heard on some of the Woody Guthrie records I had. Sonny and Brownie were both most gracious in talking with the curious kid that I was. Speakiing with them was an incredible experience that taught me so much more than I realized at the time. By the mid-1970s, I was producing concerts in Montreal and was honored to present a couple of shows with Sonny and Brownie. Indeed, the entire album is a loving homage to the inspiring folk-blues masters. Guy and Fabrizio include several of Sonny and Brownie’s original songs and a bunch of other songs drawn from their extensive repertoire. Of special note, though, is the opening title track. Guy says he improvised “Sonny and Brownie’s Last Train”during the recording session. The song lets us know how he feels about Sonny and Brownie and about how unique and special they were. While I enjoyed the entire 12-song set from start to finish, some of my favorite numbers included Brownie’s “Walk On,” which, as much as any song, could be called his signature song (I remember driving with him once in Montreal and his car’s California license plate read “Walk On”); “Take This Hammer” and “Midnight Special,” two songs Sonny and Brownie got from their friend Lead Belly; “Step It Up and Go,” a bouncy tune favored by a lot of the Piedmont style bluesmen of their generation; and a sweet version of “Freight Train” that hues closer to Elizabeth Cotton’s original than to Sonny and Brownie’s variant. As the guitarist, Guy recalls Brownie while Fabrizio on harmonica recalls Sonny for those of us who were lucky enough to have seen Sonny and Brownie on stage (see the drawing on the CD cover). I’ll note, though, that Guy is the only singer tackling songs on which both Brownie and Sonny variously took the lead vocals. I’ll also note that Guy is playing both harmonica and guitar on “Shortnin’ Bread” (while Fabrizio plays kick drum) while on the title track, both Guy (right channel) and Fabrizio (left channel) are playing harmonica. Guy and Fabrizio’s Sonny & Brownie’s Last Train sent me back to the subjects of the homage. 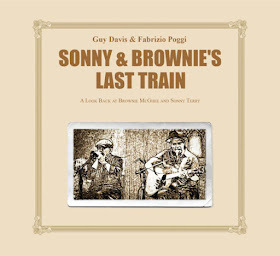 Over the past week as I’ve listened to and enjoyed Guy Davis and Fabrizio Poggi doing these songs, I’ve also been listening to and enjoying albums by Sonny Terry and Brownie McGhee. Sonny & Brownie’s Last Train was released in the U.S. on March 24. It will be released here in Canada on March 31.